I first had the pleasure of becoming acquainted with Cheryl Charming way back when I first started my journey to learning about cocktails via the webtender.com forums. Cheryl has published several cocktail related books. This being one of my favorites, Miss Charming's Book of Bar Amusements . Now a days Miss Charming is living in New Orleans and bartending at The Bombay Club where she has elevated its bar to another level. I can't wait to head down to New Orleans and visit her again. The latest news from Cheryl puts her IPhone Trivia App on sale for 99 cents through the summer of 2011. The app has 5,000 trivia questions which are always fun. The app has Miss Charming's usual flair in its styling and is very easy to use. 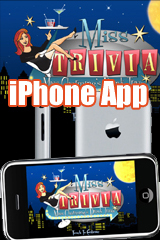 To find it in the App Store search for "Miss Trivia." Or click the ITunes button bellow. In the town of Collierville, TN where I now live I've been fortunate to find a great little watering hole called Jim's Place. Jim's Place is an excellent restaurant and has very good casual cuisine but its the bar at Jim's that keeps me coming back. More specifically its the bartender at the Jim's Place that keeps me coming back and her name is Roya. Have you ever walked into a bar and have the barkeep great you by name and ask you if you'd like your usual? If not, believe me it feels really good. Now you're probably saying to yourself, "I bet you go to this bar every night or at least very frequently." But no, what makes Roya an awesome (I don't use that word lightly) bartender is that I only go to Jim's Place once every two to three months. Her memory is simply amazing. As you sit at the bar you start to realize she is addressing everyone by their name. Its actually funny to watch some people's reaction when she greets her guests. Roya understands that customer service, decent conversation, and obviously great cocktails are the driver that keeps her clientele come back again and again. For me going to a bar is more of a social thing. I can generally make a good drink at home but you don't get that interaction that you get at a bar. Rubbing elbows to elbows with other folks you don't know but probably have something in common with is part of the overall experience. One thing I really noticed about Roya's method of operation is that she starts up a conversation with a guest, banters back and forth some, then pauses, and it usually starts up a conversation between the two strangers sitting next to each other. Now I would be remiss if I also didn't mention that Roya knows her stuff behind the stick otherwise as well. What a delight to have a bartender mix up a Manhattan, with bitters, with the right proportion if vermouth, without saying a word. So next time you find yourself in Collierville, TN (suburb of Memphis), stop into Jim's Place, where Roya knows your name. You won't be sorry.